Drying your dog from top to tail with a towel can be really tricky. The Doggy Dry from EQDOG will take this job off your hands. You only need to put the robe on your dog and the moisture from its coat will be absorbed within 10 seconds. Please note: This item is undergoing a reform. Because of this, the grey and yellow colours cannot be selected and will be chosen at random in our warehouse. You will receive either a yellow or grey Doggy Dry bathrobe. Drying your dog from top to tail with a towel can be really tricky. The Doggy Dry from EQDOG will take this job off your hands. You only need to put the robe on your dog, as the Doggy Dry distinguishes itself by the speed of moisture absorption (10 seconds). The robe is made from special and sustainable microfibers which ensure maximum absorption. After a walk in the rain or playing in the mud, put the Doggy Dry on your dog to prevent stains on yourself, the car or your home. By putting the robe on your dog after an activity involving water, you can let the microfibers in the robe do all the work. 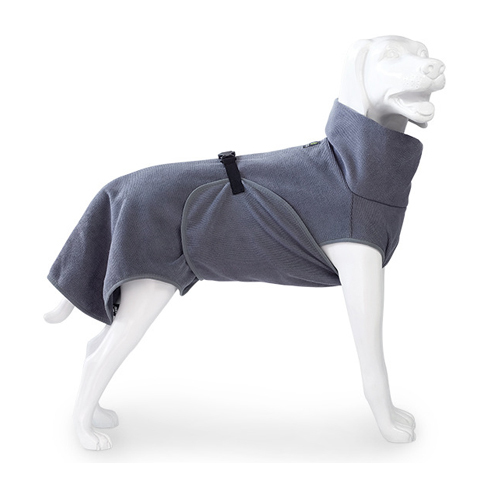 The robe contains special microfibers that absorb the moisture from your pet's coat. The dog robe has an extra wide neck opening and two adjustable buckles that ensure a perfect fit. The long and wide piece of fabric at the abdomen provides the right fit for your dog. Doggy Dry is available in various sizes. Doggy Dry is machine washable. Following a product innovation, sizes S, M and L are only available in grey. What if the Doggy Dry doesn't fit? The Doggy Dry can be removed from the packaging and held up next to the dog in order to check whether the robe fits. For hygiene reasons, the robe cannot be returned if it has come into contact with the dog. If we find that the returned robe is stained, worn, contains animal hair, smells or has been washed after use, we cannot return the product to you. In this event, it will be donated to a charity (local shelter). As we are often confronted with Recovery Shirts that are returned in a less than new condition, we have to apply these rules for fitting and/or returning products. Have you used Doggy Dry before? Let us know what you think about this product.